I am writing to let you know that seven of your photos with a creative commons license have been short-listed for inclusion in our Schmap Paris Guide, to be published late March 2006.
iv) Download and preview a sample Schmap Guide. Our submission deadline is Sunday, March 5. If you happen to be reading this message after this date, please still click on the link above (our Schmap destination guides are updated frequently - photos submitted after this deadline will be considered for later releases). She doesn't have photos or contacts or profile. If I accepted to have my photos on Schmap, I would practically give the right to them to do anything they like with my photos for the rest of their life! I remember reading several threads about this kind of ripoff: not only do they steal the photographer's work, but try to bind him (her) with some contractual release - worse, they'll end up offering you to buy their catalogue, i.e. paying for your own shots! Hi Claudecf I remember reading several threads about this kind of ripoff: not only do they steal the photographer's work, but try to bind him (her) with some contractual release - worse, they'll end up offering you to buy their catalogue, i.e. paying for your own shots! I received an email from a "CountCristo" (again with very little info in the profile) who said they were interested in buying some of my images. Is this type of thing common on Flickr as I'm a new member? I received an email from a &quot;CountCristo&quot; (again with very little info in the profile) who said they were interested in buying some of my images. Is this type of thing common on Flickr as I'm a new member? musicorso, I removed all my photos and didn't click anything else. I also sent a note to Staff. I'm not entirely sure I'd always assume all contacts through Flickr are rip-offs (though I wouldn't pay a company to use my photos!). I think it depends on what it is you want from your photography. As an example, I agreed to take photos for a local guidebook called Itchy Guides. It was unpaid and I expect they now own the rights to the photos I took, but I'm not bothered by that. It was fun, it was good experience (I had to negotiate photography in some establishments) and I got to see my name in the credits of guidebooks sold here in Cambridge. I got that mail too, but decided to let them use the photo if they want. That's what the Creative Commons licence is for anyway. You can opt out of using that particular licence in your Flickr options. I don't think my photo is going to make anybody rich, but if they want to use it'll be interesting to see what happens. <a href="http://www.flickr.com/photos/karlobrien/56642219/in/set-1095284/"> <img src="http://static.flickr.com/27/56642219_58bec5fd4c_t.jpg" /> </a> I got that mail too, but decided to let them use the photo if they want. That's what the Creative Commons licence is for anyway. You can opt out of using that particular licence in your Flickr options. I don't think my photo is going to make anybody rich, but if they want to use it'll be interesting to see what happens. I've allowed Schmap to put one of my images on the "Submitted Short-listed Photos". The Terms of Submission look fair and because of the CC licence on my images they could have used it without asking. Schmap looks like a commercial site, so they can't use without permission a CC licensed image that includes "non-commercial" in its terms (which I believe Claude uses on her photos). Schmap looks like a commercial site, so they can't use without permission a CC licensed image that includes &quot;non-commercial&quot; in its terms (which I believe Claude uses on her photos). I also had the same mail from schmap asking to use one of my pictures for their London guide. 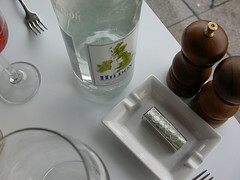 The photo was of a table setting in London's Oxo Tower Brasserie. I'm pleased to reply here and assure any flickr users reading this that Schmap is the real deal. Our first 14 Schmap destination guides will be released March 22. Many short-listed flickr photographers have already downloaded a preview guide--and returned feedback and kind wishes for our launch. Regarding our 'Terms of Submission', we've tried to make these as fair as possible. One short-listed photographer has even posted an analysis of these on his blog. There are indeed no photos posted on this account. However, you are all welcome to view my own humble efforts, posted under my personal username, the zen master. I think it's funny how people who obviously want their photos get exposure by using flickr always cry "rip-off" whenever anyone offers to give them further exposure. Schmap want one of mine as well, and I'm quite happy to let them use it if they want to. I think it's funny how people who obviously want their photos get exposure by using flickr always cry &quot;rip-off&quot; whenever anyone offers to give them further exposure. Schmap want one of mine as well, and I'm quite happy to let them use it if they want to. It depends on who you want to expose your photos to and what you want done with them. Some people just want feedback from other photographers so they can improve their skills, not be used commercially. I understand that the photos selected are CC licenced but maybe the person doing so did not understand the consequences of that licence. I congratulate Schmap Guides on the process they followed, as pointed out they could have just grabbed the photos and done with them what they wanted, they took the high road in my opinion. They contacted the person that owns the photo before they used it, even though they did not have to. They are allowing the owner to opt out, even though they don't have to. Though presumably Schmap will be charging for their guides. Is this the case? If so, it'd be nice if they'd give the photographers a free copy of the finished product - not just a sample download, otherwise it'd look like one of those 'we'll publish your poem for free, then you buy the book from us' type scams. But from what I see the guides look kinda cool, so hopefully they're on the level. It appears to be free download only and supported by advertising. Good stuff - I look forward to trying them out! I got about 7 photos total requested. Two for London and five for Dublin... still pondering about it. I would think that if you are a professional photographer who makes your living through your photos you would think twice, but if like me you just enjoy taking photos it seems a fair deal. As long as they remain free online guides and their viewer is freeware. I would be concerned about the risk of spyware being installed though. You plan your trip - they know where you're going! I would think that if you are a professional photographer who makes your living through your photos you would think twice, but if like me you just enjoy taking photos it seems a fair deal. As long as they remain <i>free</i> online guides and their viewer is <i>freeware</i>. I would be concerned about the risk of spyware being installed though. You plan your trip - they know where you're going! Giving your work away for free - and to a commercial publication, no less! - cheapens all photography. The increasing prevalence of casual photographers and stringer hobbyists reduces the market value of professional photographer's work. I am (obviously) no pro, but for the first time I suddenly see very clearly what one of my pro friends means when he talks about such things. It's sad to see a profession slowly (quickly?) die; even sadder to see something I greatly enjoy (flickr) be a tool to increase the speed at which a cool profession dies. Giving your work away for free - and to a commercial publication, no less! - cheapens all photography. The increasing prevalence of casual photographers and stringer hobbyists reduces the market value of professional photographer's work. I am (obviously) no pro, but for the first time I suddenly see very clearly what one of my pro friends means when he talks about such things. It's sad to see a profession slowly (quickly?) die; even sadder to see something I greatly enjoy (flickr) be a tool to increase the speed at which a cool profession dies. Amen for that, Theodoric !! I enjoy views, comments and favourites like any flickr person, but am not looking for exposure, or else I'd go elsewhere. And I don't appreciate commercial companies using flickr to contact me. @ Andy Lock I am not <i>crying rip off</i>. I am flickring for fun, not to sell my photos, which I don't think so highly of ;) I enjoy views, comments and favourites like any flickr person, but am not looking for exposure, or else I'd go elsewhere. I have authorised several students to use my photos, I have given some away to a quilt and patchwork association for their journal, but I do not want a commercial company to use them, which is, I think, what the CC license means, or else, I didn't get it. Even more so when some of the photos chosen happened to have a brand on them... And I don't appreciate commercial companies using flickr to contact me. Theodoric, not only does the profession of photography die, but so does the quality of work...eventually. Not that some of the photographs aren't nice or even great that are chosen for such publications, but the majority can be considered mediocre or amateurish by professional standards. When amateur photography becomes common place in books, magazines and other publications, the stardards of the people who are buying these things also goes down, and the people selling it are still making the same amount of money...yet not paying anyone for their work. In this situation from the first post, the company seems legit and people are happy with it, but they should at least give the photographers who donate images to it a free copy of the book at the least. Come on now. Theodoric, not only does the profession of photography die, but so does the quality of work...eventually. Not that some of the photographs aren't nice or even great that are chosen for such publications, but the majority can be considered mediocre or amateurish by professional standards. When amateur photography becomes common place in books, magazines and other publications, the stardards of the people who are buying these things also goes down, and the people selling it are still making the same amount of money...yet not paying anyone for their work. In this situation from the first post, the company seems legit and people are happy with it, but they should at least give the photographers who donate images to it a free copy of the book at the least. Come on now. @ Violentz - there is no book. It's an online guide only. @Claudecf - Well, that's fine for you, but others on Flickr do want commercial exposure (hence all the calls for commercial uses of Flickr - to which they have suggested they will be accommodating). Perhaps you could state in your profile that you do not want to be contacted by commerical entities? @ Theodoric and Violentz - it was ever thus. I've been taking photos for more than 20 years but am not a professional photographer. It has not stopped me from using my photos in a wide range of commercial products - long before Flickr or even the internet existed! People who want quality photography will go to commercial photographers. Those who just want an inexpensive image for their publication will get the images from wherever they see fit. @ Violentz - there is no book. It's an online guide only. @Claudecf - Well, that's fine for you, but others on Flickr do want commercial exposure (hence all the calls for commercial uses of Flickr - to which they have suggested they will be accommodating). Perhaps you could state in your profile that you do not want to be contacted by commerical entities? @ Theodoric and Violentz - it was ever thus. I've been taking photos for more than 20 years but am not a professional photographer. It has not stopped me from using my photos in a wide range of commercial products - long before Flickr or even the internet existed! People who want quality photography will go to commercial photographers. Those who just want an inexpensive image for their publication will get the images from wherever they see fit. The terms of submission for Schmap are very fair and very much in the spirit of creative commons. If you wish to decline the possible use of your photos it's easy to do that. Anyone who has their photos licensed under non commercial CC, but objects to being approached for their use in situations like Schmap, has misinterpreted CC, Schmap, or both. Too right, teotwawki, anything else sounds like Commie talk to me! Too right, <b>teotwawki</b>, anything else sounds like Commie talk to me! Schmap looks cool to me. They shortlisted eight of my images. OK. Approved. This same cheapening happened with typography. My typographer friends were suddenly out of work - and publication quality has declined as you may have noticed. Everyone with a computer now thinks they can publish. Well, they can, but it isn't the same. Schmap looks cool to me. They shortlisted eight of my images. OK. Approved. This same cheapening happened with typography. My typographer friends were suddenly out of work - and publication quality has declined as you may have noticed. Everyone with a computer now thinks they can publish. Well, they can, but it isn't the same. Further, what Yolise said. teotawki - Flickr (and other similar photo sharing apps) have increased the population of available photographs, and increased exposure for casual photographers. Casual photographers who are happy for a mention instead of payment, casual photographers who do not rely on this for their living. Standard market forces at work here. Dramatically increase the pool of cheap (or free) labor and it will reduce the market value for the products of labor. That's kind of just the way it goes, though, isn't it? The internet has made it possible for people to publish for very little and so the same thing has happened to publishing in general, like Van suggested. I have a feeling it will even out. Either that or adapt or die, I guess. I guess what makes me sad is to see the real artists affected by such tech advances and market forces. <b>yolise and Van</b> Agreed. Adapt or die. I suspect tech advances and these market forces will dramatically reduce the average price for 95% of photographs, but there will remain a reasonable market for the 5%, for those willing to pay a premium price for premium photographs. (Sturgeon's Law, anyone?) I guess what makes me sad is to see the real artists affected by such tech advances and market forces. @ClaudeCF: I'd probably do the same thing you've done in this case. The Schmap site says precious little about where they get their money, but they must get money from somewhere, and if they offer none of it to the photographers whose work their product is based on, it's not fair. That said, it has been my experience so far that when a photo is published exclusively online, no money changes hands. Whereas in a print publication (newspaper, magazine, book, brochure, etc.) there is almost always payment if you ask for it. This may not be fair or right, but it appears to be standard. I find it odd that you don't think highly of selling one's photos. Are you saying you want photography as a profession to end forever? If someone loves photography and is good at it, don't they have a right to make a living doing it? @Theodoric: I agree with you about the danger to pro photographers. My professional friends have had to change strategies rapidly in recent years (shifting towards stock photography) to keep their livelihoods going. I've tried to do my part to keep the threshold high by not being one of those "just glad to be mentioned" people. @ClaudeCF: I'd probably do the same thing you've done in this case. The Schmap site says precious little about where they get their money, but they must get money from somewhere, and if they offer <i>none</i> of it to the photographers whose work their product is based on, it's not fair. That said, it has been my experience so far that when a photo is published exclusively online, no money changes hands. Whereas in a print publication (newspaper, magazine, book, brochure, etc.) there is almost always payment if you ask for it. This may not be fair or right, but it appears to be standard. I find it odd that you don't think highly of selling one's photos. Are you saying you <i>want</i> photography as a profession to end forever? If someone loves photography and is good at it, don't they have a right to make a living doing it? @Theodoric: I agree with you about the danger to pro photographers. My professional friends have had to change strategies rapidly in recent years (shifting towards stock photography) to keep their livelihoods going. I've tried to do my part to keep the threshold high by not being one of those &quot;just glad to be mentioned&quot; people. Just thinking aloud (sorry), but hasn't the digital revolution improved typography rather than cheapened it? I was looking at a newspaper from 1954 and the typography was horrendous. Obviously they were setting type by hand to a tight deadline, but it was still dire. It used to be that you had to apprentice to become a typographer, so there were a wide range of abilities from true artists to talentless hacks. Digital type has put it in more hands and perhaps weeded out the bad technicians and replaced them with more and better ones? I used to know some pretty poor film photographers in the day. But they had the studios and the equipment, so they got the work. I'm not sure this is a direct parallel, but there are similarities, I think. Just thinking aloud (sorry), but hasn't the digital revolution improved typography rather than cheapened it? I was looking at a newspaper from 1954 and the typography was horrendous. Obviously they were setting type by hand to a tight deadline, but it was still dire. It used to be that you had to apprentice to become a typographer, so there were a wide range of abilities from true artists to talentless hacks. Digital type has put it in more hands and perhaps weeded out the bad technicians and replaced them with more and better ones? I used to know some pretty poor film photographers in the day. But they had the studios and the equipment, so they got the work. I'm not sure this is a direct parallel, but there are similarities, I think. I am still not sure what to do. My "choosen" pictures are not that great, so I wouldn't mind them to be used for a guide. What I don't like is the added exposure my photostream might get from this publication. I know very well that most of my pictures are public and could be seen by anybody. But every once in a while I upload some pictures that reveal a bit too much of my personal life, and I don't want to think about making some of my pics private every time I upload something. Once again, this incident has shown me how careless I usually am about giving away information I might not want the whole world to know. And yes, somewhere on the Schmap site I read that they will get their future revenue by adds. So it is a commercial site after all - even if they let people download the guides free of charge. Interesting discussion. I was looking for some advice because I have been contacted by Alexandra, too. Thank you, I appreciate you contacting me before using my photos, but ... I am still not sure what to do. My &quot;choosen&quot; pictures are not that great, so I wouldn't mind them to be used for a guide. What I don't like is the added exposure my photostream <i>might</i> get from this publication. I know very well that most of my pictures are public and could be seen by anybody. But every once in a while I upload some pictures that reveal a bit too much of my personal life, and I don't want to think about making some of my pics private every time I upload something. Once again, this incident has shown me how careless I usually am about giving away information I might not want the whole world to know. Any thoughts on that? And yes, somewhere on the Schmap site I read that they will get their future revenue by adds. So it is a commercial site after all - even if they let people download the guides free of charge. yolise - Agreed. You can't ban technology just because it empowers people. Doesn't the Creative Commons agreement exist to allow people share their works for free with others, who can then do whatever the hell they want with them? Flickr specifically asks what type of licencing you want to apply to your photographs - if you don't agree, then don't click the 'agree' button. I've gotten huge benefit from the free and open source goodies I've found on the internet over the years - I pay my bills by using tools that are available for free. So when I saw the Creative Commons agreement when I joined Flickr I though it was a cool way to give a little something back. If you've got a Creative Commons licence on your photos, Schmap didn't have to ask you permission (since you've already given it), but it's cool that they did. If you've got the non-commercial licence, then that's why they did ask. If you don't want anybody using your photos, just remove the licence you put on them. <b>yolise - </b> Agreed. You can't ban technology just because it empowers people. Doesn't the Creative Commons agreement exist to allow people share their works for free with others, who can then do whatever the hell they want with them? Flickr specifically asks what type of licencing you want to apply to your photographs - if you don't agree, then don't click the 'agree' button. I've gotten huge benefit from the free and open source goodies I've found on the internet over the years - I pay my bills by using tools that are available for free. So when I saw the Creative Commons agreement when I joined Flickr I though it was a cool way to give a little something back. If you've got a Creative Commons licence on your photos, Schmap didn't have to ask you permission (since you've already given it), but it's cool that they did. If you've got the non-commercial licence, then that's why they did ask. If you don't want anybody using your photos, just remove the licence you put on them. "I am still not sure what to do. My "choosen" pictures are not that great, so I wouldn't mind them to be used for a guide." This sort of proves my point. Wouldn't you want them to use your best work, rather than having stuff you aren't crazy about being used? <i> &quot;I am still not sure what to do. My &quot;choosen&quot; pictures are not that great, so I wouldn't mind them to be used for a guide.&quot;</i> This sort of proves my point. Wouldn't you want them to use your best work, rather than having stuff you aren't crazy about being used? Right, Violentz. I was thinking the same - especially because one of the pictures (for a guide to Venice) is of the Ponte dei Sospiri and can be found on Flickr by many other members. I have much better Venice pictures, so why those? I'm impressed by Schmap's submission page. They've answered most of my concerns -- the images are clearly attributed to me, there's a link-back to Flickr, and there's an overall index of photographers in the credits of the guide. Additionally, the terms seem fair to me (they can use the image in future guides; I'm not giving up exclusive rights to my images). I was happy to submit my Rome pictures. Theodoric's concerns are valid, but I'm afraid that the landscape for professional photographers is shifting. Flickr itself is a testament to the extraordinary range of amazing work that talented non-pros can do. Interesting discussion. I'm impressed by Schmap's submission page. They've answered most of my concerns -- the images are clearly attributed to me, there's a link-back to Flickr, and there's an overall index of photographers in the credits of the guide. Additionally, the terms seem fair to me (they can use the image in future guides; I'm not giving up exclusive rights to my images). I was happy to submit my Rome pictures. Theodoric's concerns are valid, but I'm afraid that the landscape for professional photographers is shifting. Flickr itself is a testament to the extraordinary range of amazing work that talented non-pros can do. It's kind of weird to read, I enjoy views, comments and favourites like any flickr person, but am not looking for exposure. Call me crazy, but I would say views, comments and favourites are exposure. As for what you do with your photos, that's your choice. It's kind of weird to read, <i>I enjoy views, comments and favourites like any flickr person, but am not looking for exposure.</i> Call me crazy, but I would say views, comments and favourites <i>are</i> exposure. As for what you do with your photos, that's your choice. Wouldn't you want them to use your best work, rather than having stuff you aren't crazy about being used? the size that they need; some photos work better as thumbnails, while others need to be seen at larger sizes to be appreciated. I know I'm not the best judge of my work. We must all have the experience of seeing photos that are inexplicably (to us) favorited over and over again. Violentz said: <i>Wouldn't you want them to use your best work, rather than having stuff you aren't crazy about being used?</i> I'd agree, but you can always refuse to submit an image you're not fond of. But we also don't know what they need. Maybe your photo works better in the size that they need; some photos work better as thumbnails, while others need to be seen at larger sizes to be appreciated. I know I'm not the best judge of my work. We must all have the experience of seeing photos that are inexplicably (to us) favorited over and over again. Maybe my thoughts about added exposure further up in this discussion are somewhat more specific than the sentence you quote? Ben McLeod: Maybe my thoughts about <a href="http://www.flickr.com/groups/central/discuss/72057594072528281/#comment72057594072708907">added exposure</a> further up in this discussion are somewhat more specific than the sentence you quote? yolise, typography was cheapened by the digital age because it removed the incentive to be a professional font designer, for the most part. Back in the days of yore, font design was hard and it was difficult to copy a font. So a newspaper would buy a really good copy of a limited set of fonts. The problem is that the typeface itself is not able to be protected. So if I make a nifty typeface, I can copyright the file that it exists in, but somebody can make an exact duplicate of my typeface and there's nothing I can do. I mean, look at Arial. They tweaked three letters ever so slightly but otherwise, it's a rip off of Helvetica. What digital typography has created for us is a huge variety of badly hinted, badly kerned, novelty typefaces; a blurring of the boundries between semibold, demibold, and bold; a blurring of the boundries between italic and oblique; and a lack of appreciation for the simple beauty of a properly designed text face. yolise, typography was cheapened by the digital age because it removed the incentive to be a professional font designer, for the most part. Back in the days of yore, font design was hard and it was difficult to copy a font. So a newspaper would buy a really good copy of a limited set of fonts. The problem is that the typeface itself is not able to be protected. So if I make a nifty typeface, I can copyright the file that it exists in, but somebody can make an exact duplicate of my typeface and there's nothing I can do. I mean, look at Arial. They tweaked three letters ever so slightly but otherwise, it's a rip off of Helvetica. What digital typography has created for us is a huge variety of badly hinted, badly kerned, novelty typefaces; a blurring of the boundries between semibold, demibold, and bold; a blurring of the boundries between italic and oblique; and a lack of appreciation for the simple beauty of a properly designed text face. Assuming there was wide-spread appreciation for type in the first place. It's a bit of a specialist subject, then and now, I feel. <i>a lack of appreciation for the simple beauty of a properly designed text face</i> Assuming there was wide-spread appreciation for type in the first place. It's a bit of a specialist subject, then and now, I feel. Didn't the medieval clergy oppose printing (including typefaces) because it let the common man produce books, and upset their monopoly? A few centuries on & we seem to have turned out alright. Like I said above, opposing technology just because it lets people achieve what was once only achievable by the select few is crazy. Didn't the medieval clergy oppose printing (including typefaces) because it let the common man produce books, and upset their monopoly? A few centuries on &amp; we seem to have turned out alright. Like I said above, opposing technology just because it lets people achieve what was once only achievable by the select few is crazy. I find it odd that you don't think highly of selling one's photos. This is not what I meant at all, probably expressed myself badly as English isn't my mother tongue. I meant that I didn't think highly of my own photos. @otherthings <i>I find it odd that you don't think highly of selling one's photos.</i> This is not what I meant at all, probably expressed myself badly as English isn't my mother tongue. I meant that I didn't think highly of my own photos. Other concerns aside, there are at least two big problems with this. 1) "Ad-supported" is still a commercial use, even if you say it's not. Alexandra Moss, you might have the best intentions, but what you've set up here is not what you're claiming it to be. Caviar, I don't know if you read the terms as presented by Schmap. By accepting them, you grant Schmap the right to use your photo on the site, but you don't give up your copyright of the image itself. You certainly don't give them exclusive rights to the image (which seems to be what you're implying in item 2). It's worded as to imply that the content is protected by copyright. They don't say it is protected by their copyright only. They should probably, however, say "you may not modify or use the Materials for any other purpose without express written consent of Schmap or the copyright-holder" or something to that effect. It's worded as to imply that the content is protected by copyright. They don't say it is protected by their copyright only. They should probably, however, say &quot;you may not modify or use the Materials for any other purpose without express written consent of Schmap or the copyright-holder&quot; or something to that effect. Caviar - by your argument, Flickr itself is violating the Creative Commons license. Non pro users see ads. Therefore Flickr is generating income from your photos. Now the no ad-blocking EULA on the Schmap site is hilarious. Right now that falls under the heading of 'Try and stop me.' I am sure some webmaster somewhere will figure out a way to detect adblock (I think I've seen a proof of concept of it out there somewhere) but then we'll just be in a new arms race - the adblock folks bypassing the adblock detection - ad nauseum. But in the end, Schmap has gone above and beyond with their efforts to make sure everyone was well-informed about how their photos would be used and everyone has had the chance to decline. If you're uncomfortable, click "No" and move on. I find the comments that pro photographers are finding their profession "cheapened" by amateurs to be silly and elitist, quite frankly. Like all professions, one has to constantly be improving their skills and adapting to the marketplace. I find it refreshing that photographers are now having to deal with the same professional pressures other people have had to deal with for decades. If I don't improve my skills in IT on a regular basis, I quickly find myself unqualified and my employment prospects dim. Otherthings touched on this above - he has pro friends who are actively adapting their skillset to remain professional photographers. Caviar - by your argument, Flickr itself is violating the Creative Commons license. Non pro users see ads. Therefore Flickr is generating income from your photos. Now the no ad-blocking EULA on the Schmap site is hilarious. Right now that falls under the heading of 'Try and stop me.' I am sure some webmaster somewhere will figure out a way to detect adblock (I think I've seen a proof of concept of it out there somewhere) but then we'll just be in a new arms race - the adblock folks bypassing the adblock detection - ad nauseum. But in the end, Schmap has gone above and beyond with their efforts to make sure everyone was well-informed about how their photos would be used and everyone has had the chance to decline. If you're uncomfortable, click &quot;No&quot; and move on. I find the comments that pro photographers are finding their profession &quot;cheapened&quot; by amateurs to be silly and elitist, quite frankly. Like all professions, one has to constantly be improving their skills and adapting to the marketplace. I find it refreshing that photographers are now having to deal with the same professional pressures other people have had to deal with for decades. If I don't improve my skills in IT on a regular basis, I quickly find myself unqualified and my employment prospects dim. Otherthings touched on this above - he has pro friends who are actively adapting their skillset to remain professional photographers. Adapt or die. flickr is not violating the CC license because it's part of their terms of service that you grant them permission to display ads next to your work. flickr makes no claim of being a non-commercial endeavor, and is quite clear on this point, unlike Schmap. Also, I'm personally offended when someone wants to make money off off CC-licensed work, but won't release their own content back into the commons. Schmap is licensed under full copyright, and has harsh terms for their own content. Why should the community be supporting them? If they want to open up and join the party, more power to them. But they haven't done that, and they're presenting the site as some sort of community portal, when in fact it's just an ad-supported commercial venture. flickr is not violating the CC license because it's part of their terms of service that you grant them permission to display ads next to your work. flickr makes no claim of being a non-commercial endeavor, and is quite clear on this point, unlike Schmap. Also, I'm personally offended when someone wants to make money off off CC-licensed work, but won't release their own content back into the commons. Schmap is licensed under full copyright, and has harsh terms for their own content. Why should the community be supporting them? If they want to open up and join the party, more power to them. But they haven't done that, and they're presenting the site as some sort of community portal, when in fact it's just an ad-supported commercial venture. Look at Related Internet Links on the left. Once there's a better way of searching CC images, someone should point them here instead. Here's an interesting related thing. The BBC website is using images from 'freefoto.com': <a href="http://news.bbc.co.uk/1/hi/health/4763528.stm">news.bbc.co.uk/1/hi/health/4763528.stm</a> Look at Related Internet Links on the left. Once there's a better way of searching CC images, someone should point them here instead. I've been an artist and art teacher for years, including work as a graphic artist, packaging designer, and marketing director. It's always a complaint from artists of any sort when technology makes competition increase. However, if an artist can't stand to have competition, they should rethink their profession (those that make or intend to make a living from it). Competition and popularity increases knowledge and appreciation from the public at large! More of the US population has grown to appreciate at the very least a wider range of creative expression due to the ubiquity of the Internet as global communication. Including the arts! quality wins out in the long run, for those who make do with less than good quality for their business concerns are also in competition with their peers who do promote quality presentations online and in published/printed materials. Think of all the galleries that now promote themselves and the artists they represent online. The "ART Business" has always been competitive, and digital photography with online publishing has actually exploded demand for quality artists and photographers. I disagree that popular expanded interest in photography has degraded the art form - instead, it is undergoing important rejuvenation and potential, including compensation and careers. I've been an artist and art teacher for years, including work as a graphic artist, packaging designer, and marketing director. It's always a complaint from artists of any sort when technology makes competition increase. However, if an artist can't stand to have competition, they should rethink their profession (those that make or intend to make a living from it). Competition and popularity increases knowledge and appreciation from the public at large! More of the US population has grown to appreciate at the very least a wider range of creative expression due to the ubiquity of the Internet as global communication. Including the arts! quality wins out in the long run, for those who make do with less than good quality for their business concerns are also in competition with their peers who do promote quality presentations online and in published/printed materials. Think of all the galleries that now promote themselves and the artists they represent online. The &quot;ART Business&quot; has always been competitive, and digital photography with online publishing has actually exploded demand for quality artists and photographers. I disagree that popular expanded interest in photography has degraded the art form - instead, it is undergoing important rejuvenation and potential, including compensation and careers. cobalt123, what you say makes sense. I never gave much thought to the art of photography until I started taking my own photos. My interest in improving has led me to find out more about "the Masters," which has given me a more critical eye (in a positive sense). This (and my own attempts at photography) have given me a much greater appreciation for how hard it is to make a really good, artful photograph, and a new respect for the artists who manage it. That respect hasn't led to increased income for any photographer yet--but it has made me seriously consider the purchase of someone else's work for the first time. cobalt123, what you say makes sense. I never gave much thought to the art of photography until I started taking my own photos. My interest in improving has led me to find out more about &quot;the Masters,&quot; which has given me a more critical eye (in a positive sense). This (and my own attempts at photography) have given me a much greater appreciation for how <i>hard</i> it is to make a really good, artful photograph, and a new respect for the artists who manage it. That respect hasn't led to increased income for any photographer yet--but it has made me seriously consider the purchase of someone else's work for the first time. But what defines commercial use? Clearly, using your image to sell a product would be a commerical use. But if the product is given away for free in hopes of making money indirectly via advertising, that's less clear. And how about nonprofits? If they use your image to promote a conference for their nonprofit members, would that be a commerical use or not? I'd like a clearer definition from Creative Commons. Creative Commons is rather vague on what is considered commerical and noncommerical. In fact, all I can find is “Noncommercial. You may not use this work for commercial purposes.” But what defines commercial use? Clearly, using your image to sell a product would be a commerical use. But if the product is given away for free in hopes of making money indirectly via advertising, that's less clear. And how about nonprofits? If they use your image to promote a conference for their nonprofit members, would that be a commerical use or not? I'd like a <a href="http://jasonpearce.com/blog/2006/03/01/creative-commons-noncommercial/">clearer definition</a> from Creative Commons. jasonpearce: That ambiguity had occurred to me as well. But I found this definition of 'commericial use': "Any wholesale, retail, or service business activity established to carry on trade for profit." Based on that, I'd say if the intent is to attract advertising dollars, then that would be for commercial use. Promoting a conference for a not for profit would not be commercial use. IMO. <b>jasonpearce</b>: That ambiguity had occurred to me as well. But I found this definition of 'commericial use': <i>&quot;Any wholesale, retail, or service business activity established to carry on trade for profit.&quot;</i> Based on that, I'd say if the intent is to attract advertising dollars, then that would be for commercial use. Promoting a conference for a not for profit would not be commercial use. IMO. It seems that Schmap is also ignoring the "Share-Alike" provision in many CC licenses, which requires that derivative works be made available to the public under the same terms as the original image. Schmap is of course free to approach photographers and ask them to license images for free. Photographers are of course free to accede to or reject this request. But Schmap is not proposing to license images under CC licenses...after all, they wouldn't need to ask permission if that's what they were doing. They are, I think, looking for photographers who are amenable to unconventional licensing. I also note that Schmap's own website says "all rights reserved." I agree; I don't object at all to being approached -- and would much rather that they do so, as it's really no fun to have to chase down people who aren't willing to abide by licenses. They've gotta realize, though, that asking to use my photos outside the terms of the pre-existing CC license, for no consideration, is a tough sell. Personally, I'm writing them back and letting them know this, and asking them what rights they'd like to license from me and what a fair consideration might be. <i>Anyone who has their photos licensed under non commercial CC, but objects to being approached for their use in situations like Schmap, has misinterpreted CC, Schmap, or both.</i> I agree; I don't object at all to being <i>approached</i> -- and would much rather that they do so, as it's really no fun to have to chase down people who aren't willing to abide by licenses. They've gotta realize, though, that asking to use my photos outside the terms of the pre-existing CC license, for no consideration, is a tough sell. Personally, I'm writing them back and letting them know this, and asking them what rights they'd like to license from me and what a fair consideration might be. I am not a lawyer, but my quick take is that all of the CC licenses (and not all forbid commercial use either) carry a clause that says explicitly that the any part of the license may be set aside by a specific agreement with the owner. It seems that Schmap is asking for that specific agreement in the case of photos they would like to use that are marked not for commercial use and share-alike. The owner need not agree, and regardless, the CC license continues in force for any other uses. That agreement could also (and probably does in this case) trump the share-alike clause too. None of this is violation of the CC license because they ask permission to do it. If you refuse permission and they do it anyway, then that would be a violation. I am not a lawyer, but my quick take is that all of the CC licenses (and not all forbid commercial use either) carry a clause that says explicitly that the any part of the license may be set aside by a specific agreement with the owner. It seems that Schmap is asking for that specific agreement in the case of photos they would like to use that are marked not for commercial use and share-alike. The owner need not agree, and regardless, the CC license continues in force for any other uses. That agreement could also (and probably does in this case) trump the share-alike clause too. None of this is violation of the CC license <em>because they ask permission to do it</em>. If you refuse permission and they do it anyway, then that <em>would</em> be a violation. This forum has raised some interesting questions – very helpful indeed for us at Schmap to understand the issues involved. 1. Our Terms of Submission (for consideration by short-listed photographers) provide for use of photos only in our Schmap Guides, and only in so much as these remain available free to end-users. 3. Some photographers will consider our Schmap Guides to be primarily non-commercial (since they will be free to the end-user), while others will consider them commercial (since free distribution will be supported by advertising revenue). This is why we are asking individual short-listed photographers to consider submission or withdrawal of their photos from our final selection phase. 4. The bulk of Schmap Guide content is licensed to Schmap by Wcities, who reserve all rights with respect to its use. 5. All Creative Commons photos in our Schmap Guides will be clearly marked as such, with attribution, and will link both to the full-resolution originals on flickr (to facilitate ‘share-alike’) and to the appropriate license at www.creativecommons.org. I’m delighted to say that we’ve had a great response to date from short-listed photographers – the number of ‘submits’ has outnumbered the number of ‘withdraws’ by a ratio of 20:1, with a lot of encouraging feedback from those who have downloaded our preview release. Thanks Alexandra - it all sounds good to me. I look forward to trying out your guides. I'm a big fan of the Creative Commons concept, it sort of embodies the original spirit of the net. But, I also understand the 'panic' of the artistic community, maybe seeing it as competition rather than a death knell would be more positive. Raise the standard - god knows a good professional photographer can do a lot better than me. I personally found the prices charged for photos of rubber bands, chairs, vegetables (i.e. stock photography) ludicrous - it's what made me buy a digital cameral in the first place so that I could take my own photos in order to help people who visit my Learn English web site. Is it commercial? Well I pay for the hosting through advertising, but I don't charge anyone for anything and the advertising certainly doesn't pay for my time, so IMHO it is not a commercial enterprise. As for Schmap as long as they stick to their promises (see above) and keep out of the spyware game, I don't see any problem with what they are doing. I'm a big fan of the Creative Commons concept, it sort of embodies the original spirit of the net. But, I also understand the 'panic' of the artistic community, maybe seeing it as competition rather than a death knell would be more positive. Raise the standard - god knows a good professional photographer can do a lot better than me. I personally found the prices charged for photos of rubber bands, chairs, vegetables (i.e. stock photography) ludicrous - it's what made me buy a digital cameral in the first place so that I could take my own photos in order to help people who visit my Learn English web site. Is it commercial? Well I pay for the hosting through advertising, but I don't charge anyone for anything and the advertising certainly doesn't pay for my time, so IMHO it is not a commercial enterprise. As for Schmap as long as they stick to their promises (see above) and keep out of the spyware game, I don't see any problem with what they are doing. The way I look at it, is some real artists are liberated by technology to show their creative ability, an ability that would have been snuffed out in the days when cameras cost an arm and a leg. Similarly, in 3D animation, I believe that the availability of high quality freeware apps is allowing everyone who is innately a real artist to make a contribution to the field, not just those who happened to be employed by a studio which laid out gazillions for $$-ware. <i>I guess what makes me sad is to see the real artists affected by such tech advances and market forces. </i> The way I look at it, is some <b>real artists</b> are liberated by technology to show their creative ability, an ability that would have been snuffed out in the days when cameras cost an arm and a leg. Similarly, in 3D animation, I believe that the availability of high quality freeware apps is allowing everyone who is innately a <b>real artist</b> to make a contribution to the field, not just those who happened to be employed by a studio which laid out gazillions for $$-ware. Actually, I've found that technology has made me want to use it less(ish). I feel like my digital shots are just snaps, while my film photos feel more like 'art' to me. If a professional photographer's pictures are being ousted by a flood of amateurs and he can no longer charge money for them, perhaps he should consider his pictures weren't that great to start with? That's certainly true. My take on it is that if you've chosen an NC license though, you've issued a blanket rejection of commercial use without compensation, since there's a separate license that you could have chosen that allows that, and you didn't. Negotiating compensation for individual cases is an entirely separate thing, and not what we're talking about here. Also, if you haven't looked at it, I've been arguing about it in detail with Joe Gratz in the comments of the article linked above. The discussion has been very good. On the whole, I don't know - This drew a pretty strong reaction from me originally because it's clearly a commercial use, yet it had been presented as if there was some disagreement about it, which is at best inaccurate. I still think that. <em>It seems that Schmap is asking for that specific agreement in the case of photos they would like to use that are marked not for commercial use and share-alike. The owner need not agree, and regardless, the CC license continues in force for any other uses. That agreement could also (and probably does in this case) trump the share-alike clause too. None of this is violation of the CC license because they ask permission to do it. If you refuse permission and they do it anyway, then that would be a violation. </em> That's certainly true. My take on it is that if you've chosen an NC license though, you've issued a blanket rejection of commercial use <b>without compensation</b>, since there's a separate license that you could have chosen that allows that, and you didn't. Negotiating compensation for individual cases is an entirely separate thing, and not what we're talking about here. Also, if you haven't looked at it, I've been arguing about it in detail with Joe Gratz in the comments of <a href="http://www.joegratz.net/archives/2006/02/23/schmap/">the article linked above</a>. The discussion has been very good. On the whole, I don't know - This drew a pretty strong reaction from me originally because it's clearly a commercial use, yet it had been presented as if there was some disagreement about it, which is at best inaccurate. I still think that. I'm not an attorney - but I work with them, so I see them have discussions like the one we're having here very frequently. The notion and implementation of the Creative Commons Copyright is a relatively new thing. It's not been heavily litigated or arbitrated to my knowledge. Those of us who agree to use it are doing so because we think that overall it's a good idea to deal with intellectual property issues on the Internet. But because the CC license is new, it also means that there are situations that likely didn't occur to the people that drafted the language - I think we've run into one here - and that means the language will be open to reasonable interpretation in different ways by different people. Until the CC copyright is tested, and these definitions and obligations are clearly defined in a legal way by a judge or jury, please keep in mind that your interpretation of them will be colored by your experience and your definitions and context. There may not be any "right" answers. I'm not an attorney - but I work with them, so I see them have discussions like the one we're having here very frequently. The notion and implementation of the Creative Commons Copyright is a relatively new thing. It's not been heavily litigated or arbitrated to my knowledge. Those of us who agree to use it are doing so because we think that overall it's a good idea to deal with intellectual property issues on the Internet. But because the CC license is new, it also means that there are situations that likely didn't occur to the people that drafted the language - I think we've run into one here - and that means the language will be open to reasonable interpretation in different ways by different people. Until the CC copyright is tested, and these definitions and obligations are clearly defined in a legal way by a judge or jury, please keep in mind that your interpretation of them will be colored by your experience and your definitions and context. There may not be any &quot;right&quot; answers. Just my 2 cents. I had a couple of requests from the Schmap people. Although they are to be commended for asking nicely and putting photographer links on their product (i.e. they totally grok Attribution), I think they are being VERY disengenuous (read: one of the Ten Commandments has been broken) with the concept of non-commercial. They seem about as non-commercial as, say, Google. I.e. money changes hands somewhere along the line. I wish them the same success. As a legal content owner, I am free to sell them additional rights over and above my CC licence (which offer I have yet to hear) or give them away anyway (which I did do once, so there). I had a couple of requests from the Schmap people. Although they are to be commended for asking nicely and putting photographer links on their product (i.e. they totally grok Attribution), I think they are being VERY disengenuous (read: one of the Ten Commandments has been broken) with the concept of non-commercial. They seem about as non-commercial as, say, Google. I.e. money changes hands somewhere along the line. I wish them the same success. As a legal content owner, I am free to sell them additional rights over and above my CC licence (which offer I have yet to hear) or give them away anyway (which I did do once, so there). Mia Garlick, Creative Commons’ General Counsel, sent me an email regarding my previous post. Her email stated she created a document titled "Discussion Draft - NonCommercial Guidelines" in January 2006 and would like for others to join in. I have to say that Alexandra Moss from Schmap and Mia from Creative Commons are handling this well by engaging and participating in this discussion. They've been both professional and non-defensive. So thank you both for responding to our opinions and concerns. Mia Garlick, Creative Commons’ General Counsel, sent me an email regarding my <a href="http://jasonpearce.com/blog/2006/03/01/creative-commons-noncommercial/">previous</a> <a href="http://flickr.com/groups/central/discuss/72057594072528281/#comment72057594073136650">post</a>. Her email stated she created a document titled &quot;<a href="http://creativecommons.org/weblog/entry/5752">Discussion Draft - NonCommercial Guidelines</a>&quot; in January 2006 and would like for others to join in. I have to say that Alexandra Moss from Schmap and Mia from Creative Commons are handling this well by engaging and participating in this discussion. They've been both professional and non-defensive. So thank you both for responding to our opinions and concerns. If I understand it correctly Caviar's main concern is that he feels Schmap's request is worded in a way that could easily give the (incorrect) impression that permission to use CC licensed pictures is being sought primarily as a courtesy rather than a requirement. At least permission was sought. I learnt today that one of my pictures licensed for Attribution-Non Commercial usage is currently appearing on CNET. I'm attributed but did not give permission for the image to be used. As far as I can tell from this thread and from the CC NonCommercial guidelines discussion draft, CNET's usage would definitely qualify as Commercial. If I understand it correctly Caviar's main concern is that he feels Schmap's request is worded in a way that could easily give the (incorrect) impression that permission to use CC licensed pictures is being sought primarily as a courtesy rather than a requirement. At least permission was sought. I learnt today that one of my pictures licensed for Attribution-Non Commercial usage is currently appearing on CNET. I'm attributed but did not give permission for the image to be used. As far as I can tell from this thread and from the CC NonCommercial guidelines discussion draft, CNET's usage would definitely qualify as Commercial. Wow, I am really impressed with the quality of discussion going on here! I'm particularly interested because, in retrospect, I realize we're all subject to the same ethical scrutiny. Like the Schmap folks, I also run a website, which uses other people's photos as well as my own. And like Schmap I always ask for permission, and when it's not granted for any reason, I don't use the photos. Like Your Teacher, I have always considered my site non-commercial. But due to its popularity, the bandwidth cost has become substantial, so last year, I put up some unobtrusive Google ads and a donation button. I've also accepted payment for photos that have been republished in newspapers and magazines, which goes into a fund to cover bandwidth. However, any fee that comes in explicitly for other people's photographs I give in its entirety to those photographers. So far so good. I feel like I've found a good ethical balance here, and I'm even helping some people get paid for their work. I hope that in the future, as I develop the project further, I can continue to keep that ethical balance going. If the project were to grow to the point where it somehow became profitable, I would make every effort to share that profit with the community of graffiti artists and photographers, without whose work my project wouldn't exist. If I couldn't find an effective way to do that, I would try to find some other way to compensate them. Otherwise, I'd feel like I was screwing those people big time. I have so many questions for Ms. Moss and the folks at Schmap! Right now the site is free. In the near future it will be ad-supported. But what is the goal of your enterprise? Is there a business plan? Are the people who develop the software getting paid, and if so, from what funds? Who owns the business, and do they expect to profit from it? Will the company some day be sold to Yahoo! for a zillion pesos? Or is the goal really just to provide a free community service? Are you seeking non-profit status? How do you envision your relationship with the community of photographers whose work your project depends on? If you made a profit, would you share it with them? Wow, I am really impressed with the quality of discussion going on here! I'm particularly interested because, in retrospect, I realize we're all subject to the same ethical scrutiny. Like the Schmap folks, I also run a <a href="http://grafarc.org">website</a>, which uses other people's photos as well as my own. And like Schmap I always ask for permission, and when it's not granted for any reason, I don't use the photos. Like <b>Your Teacher</b>, I have always considered my site non-commercial. But due to its popularity, the bandwidth cost has become substantial, so last year, I put up some unobtrusive Google ads and a donation button. I've also accepted payment for photos that have been republished in newspapers and magazines, which goes into a fund to cover bandwidth. However, any fee that comes in explicitly for <i>other people's photographs</i> I give in its entirety to those photographers. So far so good. I feel like I've found a good ethical balance here, and I'm even helping some people get paid for their work. I hope that in the future, as I develop the project further, I can continue to keep that ethical balance going. If the project were to grow to the point where it somehow became profitable, I would make every effort to share that profit with the community of graffiti artists and photographers, without whose work my project wouldn't exist. If I couldn't find an effective way to do that, I would try to find some other way to compensate them. Otherwise, I'd feel like I was screwing those people big time. I have so many questions for Ms. Moss and the folks at Schmap! Right now the site is free. In the near future it will be ad-supported. But what is the goal of your enterprise? Is there a business plan? Are the people who develop the software getting paid, and if so, from what funds? Who owns the business, and do they expect to profit from it? Will the company some day be sold to Yahoo! for a zillion pesos? Or is the goal really just to provide a free community service? Are you seeking non-profit status? How do you envision your relationship with the community of photographers whose work your project depends on? If you made a profit, would you share it with them? Having read the draft CC guidelines on non-commercial use (you have to click through until you get to the PDF), it still seems a bit grey. What does "in connection with" mean? I'm taking the scope of that to be "pertaining to the whole project". Others may confine themselves to the particular "supplier" transaction revolving around the CC-licenced work itself, or to the transaction involving the end-user. I think the latter is what Schmap are hoping. Photographers providing elements of a guidebook don't always get paid highly. Thousands queue up to get into Lonely Planet books, and I think all you get is another guidebook, and none of your image rights. In the commercial world, suppliers of many OEM components don't always benefit from the whole-product value chain either, or influence it very much (unless you are Intel), so it's on the face of it a bold posture to expect all the terms of your contract to be exactly duplicated further along the chain, and for this to propagate to the entire product. Like GPL components of Sun's software, you can require, if you choose, that your OEM component (i.e. your photo) be incorporated in another work without your work being inaccessible as a result. But you would have to be Intel-strength-critical to the success of that product to require that the whole product be placed in the commons. Having read the draft CC guidelines on non-commercial use (you have to click through until you get to the PDF), it still seems a bit grey. What does &quot;in connection with&quot; mean? I'm taking the scope of that to be &quot;pertaining to the whole project&quot;. Others may confine themselves to the particular &quot;supplier&quot; transaction revolving around the CC-licenced work itself, or to the transaction involving the end-user. I think the latter is what Schmap are hoping. Photographers providing elements of a guidebook don't always get paid highly. Thousands queue up to get into Lonely Planet books, and I think all you get is another guidebook, and none of your image rights. In the commercial world, suppliers of many OEM components don't always benefit from the whole-product value chain either, or influence it very much (unless you are Intel), so it's on the face of it a bold posture to expect all the terms of your contract to be exactly duplicated further along the chain, and for this to propagate to the entire product. Like GPL components of Sun's software, you can require, if you choose, that your OEM component (i.e. your photo) be incorporated in another work without your work being inaccessible as a result. But you would have to be Intel-strength-critical to the success of that product to require that the whole product be placed in the commons. > People who want quality photography will go to commercial photographers. Sorry, couldn't resist. Quality and commercial aren't the same thing. Good-quality work – however you define it – will come from good-quality photographers. Commercial is an orthogonal aspect (look it up). Now, the commercial photog will have training, equipment, resources, backup on their side. But the amateur has time, love and the freedom of not having to make their daily bread that way. &gt; People who want quality photography will go to commercial photographers. Sorry, couldn't resist. Quality and commercial aren't the same thing. Good-quality work – however you define it – will come from good-quality photographers. Commercial is an orthogonal aspect (look it up). Now, the commercial photog will have training, equipment, resources, backup on their side. But the amateur has time, love and the freedom of not having to make their daily bread that way. Hmm. OK - fair enough. How about, "people who want professional photography will go to professional photographers"? As I said later in the thread (I think), I've known some rubbish professionals in my time, so I absolutely agree with what you say. Hmm. OK - fair enough. How about, &quot;people who want professional photography will go to professional photographers&quot;? As I said later in the thread (I think), I've known some rubbish professionals in my time, so I absolutely agree with what you say. I'd love to use [your photos], but I'm unfortunately unable to negotiate non-standard terms with specific short-listed photographers. So there it ends; I wrote back and said that since Schmap isn't interested in licensing my photos (i.e., compensating me for their use of something that is of evident value to them), I'm withdrawing them from consideration of being included in their guides. I reminded Schmap that I reserve all rights to my photos, other than the rights specifically granted by the Creative Commons license, and that I consider Schmap's proposed use of the photos to be a commercial use...and thus outside the scope of the CC license. I agree with jasonpearce; kudos to Ms. Moss for participating in this discussion. However, I would much rather that Schmap said up front, "we're a commercial enterprise, we're publishing these guides as a for-profit, money-making venture, and we request permission to use your copyrighted images." It seems to me that Schmap is trying to capitalize on confusion (or even create it) regarding the scope of Creative Commons licenses, and use that confusion to acquire content (which evidently has some value to them) without having to pay for it. An update to <a href="http://www.flickr.com/groups/central/discuss/72057594072528281/72057594073183356/">my post above</a>; I heard back directly from Ms. Moss. She writes, in part:<blockquote>I'd love to use [your photos], but I'm unfortunately unable to negotiate non-standard terms with specific short-listed photographers.</blockquote>So there it ends; I wrote back and said that since Schmap isn't interested in licensing my photos (i.e., compensating me for their use of something that is of evident value to them), I'm withdrawing them from consideration of being included in their guides. I reminded Schmap that I reserve all rights to my photos, other than the rights specifically granted by the Creative Commons license, and that I consider Schmap's proposed use of the photos to be a commercial use...and thus outside the scope of the CC license. I agree <a href="http://www.flickr.com/groups/central/discuss/72057594072528281/72057594073683352/">with jasonpearce</a>; kudos to Ms. Moss for participating in this discussion. However, I would much rather that Schmap said up front, &quot;we're a commercial enterprise, we're publishing these guides as a for-profit, money-making venture, and we request permission to use your copyrighted images.&quot; It seems to me that Schmap is trying to capitalize on confusion (or even create it) regarding the scope of Creative Commons licenses, and use that confusion to acquire content (which evidently has some value to them) without having to pay for it. @Vidiot: I don't see it that way, I see people and an organisation that have been up front, honest and participating in this thread, and others, from the start. <b>@Vidiot:</b> I don't see it that way, I see people and an organisation that have been up front, honest and participating in this thread, and others, from the start. @Vidiot: if compensating you for your photos is considered "non-standard" then it seems clear that Schmap has no intention of ever compensating their photographers in any way. I wonder: do they pay the writers, or the engineers, or anyone else who contributes to the value of their product? If so, why are photographers exempt? @Vidiot: if compensating you for your photos is considered &quot;non-standard&quot; then it seems clear that Schmap has no intention of ever compensating their photographers in any way. I wonder: do they pay the writers, or the engineers, or anyone else who contributes to the value of their product? If so, why are photographers exempt? Someone pointed out above that photographers fall all over themselves to get a photo included in the Lonely Planet Guides, with much harsher terms. I am sure this is SOP for this type of book. I had a major newspaper in the northwest ask me for permission to use a photo and when I quoted my rate, which is obscenely low, they said (paraphrasing) "sorry, we don't have a budget to pay for photos!" I recieved it and thought it was junk? was i right? Depends on what you consider junk, really. Why not read the thread and decide for yourself? Does Flickr and or amatuer photography cheapen photography? No! I make my living as an editorial/sports photographer and have been amazed and inspired by some of the "amateurs" here on Flickr who have a seemingly boundless amount of pure creative energy. I wish I had more time to Flickr and enjoy it all. But is technology contributing to the real source of the cheapening of photography? IMHO, yes. The real problem is that most amateurs and many pros (including at times, myself) are poor business people and don't value their own creative work. Every day there are more people out there shooting great images, not thinking that they have any value because they are not "professional". If enough people think something has no value, eventually it doesn't. I got into the stock business late in the game, and mainly in the pro sports racket. It is such an awful market now I find it is barely worth the time to upload my outtakes to my agency. The problems are myriad for the pro photographer, but I don't feel threatened by Flickrites giving away their own work. Many of the businesses like Schmap would not exist if they couldn't con people into giving away their work. Nonetheless, I truly believe there will always be work for talented and dedicated visual story tellers. What worries me WAY more than a flood of flickrites with point and shoot cameras is the corporate beatdown being perpetrated by the real movers and shakers of the photo world like Getty Images, Corbis, and a few others. They have destroyed the agencies that used to be an umbrella for creative and motivated freelance photographers wanting to bring style and substance to photojournalism and still be able to own their work. Now, thanks to the Wal Marts of photojournalism, few of us own our assignment work anymore. If we get a cut of sales it's down from 50% to 12.5% and reporting is less than detailed. Each year there are more guys sitting in their living room in their underwear running a new stock agency, but fewer options for serious, respectable assignment work. Despite all this...I love what I do, and I love Flickr. I would advise folks to go ahead and enjoy getting exposure, but do try to make sure you don't get taken advantage of. It's a rough world out there and lots of people who are adept at getting something for nothing. Just because you don't think of yourself as a pro doesn't mean your work doesn't have any monetary value. Here's a good rule of thumb...don't sign a contract or agreement unless you get something out of it. I love how some of these places want your work for nothing AND want you to sign a contract. I've signed some bad contracts in my life...I admit it, but nothing like that. And please....no matter what else you do...keep inspiring me! Great discussion...too many points to repond to, but here are a few random thoughts.... Does Flickr and or amatuer photography cheapen photography? No! I make my living as an editorial/sports photographer and have been amazed and inspired by some of the &quot;amateurs&quot; here on Flickr who have a seemingly boundless amount of pure creative energy. I wish I had more time to Flickr and enjoy it all. But is technology contributing to the real source of the cheapening of photography? IMHO, yes. The real problem is that most amateurs and many pros (including at times, myself) are poor business people and don't value their own creative work. Every day there are more people out there shooting great images, not thinking that they have any value because they are not &quot;professional&quot;. If enough people think something has no value, eventually it doesn't. I got into the stock business late in the game, and mainly in the pro sports racket. It is such an awful market now I find it is barely worth the time to upload my outtakes to my agency. The problems are myriad for the pro photographer, but I don't feel threatened by Flickrites giving away their own work. Many of the businesses like Schmap would not exist if they couldn't con people into giving away their work. Nonetheless, I truly believe there will always be work for talented and dedicated visual story tellers. What worries me WAY more than a flood of flickrites with point and shoot cameras is the corporate beatdown being perpetrated by the real movers and shakers of the photo world like Getty Images, Corbis, and a few others. They have destroyed the agencies that used to be an umbrella for creative and motivated freelance photographers wanting to bring style and substance to photojournalism and still be able to own their work. Now, thanks to the Wal Marts of photojournalism, few of us own our assignment work anymore. If we get a cut of sales it's down from 50% to 12.5% and reporting is less than detailed. Each year there are more guys sitting in their living room in their underwear running a new stock agency, but fewer options for serious, respectable assignment work. Despite all this...I love what I do, and I love Flickr. I would advise folks to go ahead and enjoy getting exposure, but do try to make sure you don't get taken advantage of. It's a rough world out there and lots of people who are adept at getting something for nothing. Just because you don't think of yourself as a pro doesn't mean your work doesn't have any monetary value. Here's a good rule of thumb...don't sign a contract or agreement unless you get something out of it. I love how some of these places want your work for nothing AND want you to sign a contract. I've signed some bad contracts in my life...I admit it, but nothing like that. And please....no matter what else you do...keep inspiring me! For the sake of documeting this Creative Commons NonCommercial use case, I posted a few screen shots with descriptions over on Creative Commons' wiki. I really only covered the noncommerical use, so perhaps someone else can document the other concerns from this group. I also informed Mia Garlick, Creative Commons’ General Counsel, of the case study. For the sake of documeting this <a href="http://jasonpearce.com/blog/2006/03/01/creative-commons-noncommercial/">Creative Commons NonCommercial</a> use case, I posted a few screen shots with descriptions over on <a href="http://wiki.creativecommons.org/NonCommercial_use_cases">Creative Commons' wiki</a>. I really only covered the noncommerical use, so perhaps someone else can document the other concerns from this group. I also informed Mia Garlick, Creative Commons’ General Counsel, of the case study. If anyone out there wants to enrich the art of photography by BUYING some of mine, please contact me immediately! Threade of olde, arise from thy grave. I was linked to this thread by a friend who had also been approached by Schmap and wanted my feedback (well, I nagged her for the link in truth). As a long-time Linux user I've had more than my fair share of debates concerning licenses (GPL v LGPL v BSD and so on!) so I may as well jump in on this. Everyone seems to have missed the key point that you are not forbidden by the terms of the Creative Commons from re-releasing a given work later under a non-CC license. Simply put, I freely put up all my works, good or bad, under the CC for all to do with as they wish - I just ask credit. However, if I were approached by a group who wished to purchase or use my work under terms not compatible with the CC, I would be prefectly free to grant them a copy of the photo under a non-CC license. Indeed, this is how the PortgreSQL group operate. By default you download and use their database under the terms of the GPL. However, if you do not wish to be bound by it in your futur works, you may purchase a commercial non-GPL license from them for a fee. As far as the CC and Flickr go, you must bow to practical needs at some point. If you maintain the high-ground and decry that the CC is incompatible with the advertising used to support Flickr, this fine site simply would not exist. Would you be happier with a license akin to that of Photobucket, where you effectively turn over ownership of a photo to that site when you upload it? EDIT: Many edits for spelling as I aer teh suq. Threade of olde, arise from thy grave. I was linked to this thread by a friend who had also been approached by Schmap and wanted my feedback (well, I nagged her for the link in truth). As a long-time Linux user I've had more than my fair share of debates concerning licenses (GPL v LGPL v BSD and so on!) so I may as well jump in on this. Everyone seems to have missed the key point that you are not forbidden by the terms of the Creative Commons from re-releasing a given work later under a non-CC license. Simply put, I freely put up all my works, good or bad, under the CC for all to do with as they wish - I just ask credit. However, if I were approached by a group who wished to purchase or use my work under terms not compatible with the CC, I would be prefectly free to grant them a copy of the photo under a non-CC license. Indeed, this is how the <a href="http://www.postgresql.org/">PortgreSQL</a> group operate. By default you download and use their database under the terms of the GPL. However, if you do not wish to be bound by it in your futur works, you may purchase a commercial non-GPL license from them for a fee. As far as the CC and Flickr go, you must bow to practical needs at some point. If you maintain the high-ground and decry that the CC is incompatible with the advertising used to support Flickr, this fine site simply would not exist. Would you be happier with a license akin to that of Photobucket, where you effectively turn over ownership of a photo to that site when you upload it? <b>EDIT:</b> Many edits for spelling as I aer teh suq. What makes you say that, out of interest? I had a brief scan of their terms and it doesn't imply this as far as I can tell. In fact, it states: "Photobucket.com claims no ownership interest in the images posted by you at Photobucket.com". <i>Would you be happier with a license akin to that of Photobucket, where you effectively turn over ownership of a photo to that site when you upload it?</i> What makes you say that, out of interest? I had a brief scan of their terms and it doesn't imply this as far as I can tell. In fact, it states: &quot;Photobucket.com claims no ownership interest in the images posted by you at Photobucket.com&quot;. Just curious. Accordingly, in connection with your use of the Services, you grant to Photobucket.com a temporary, universal, non-exclusive, royalty-free, transferable license to: use, copy, modify, print, and display any User Content only as necessary to perform the Services and to distribute your User Content in instances where you have (i) made your album public, (ii) posted a link to your album or User Content on another website or (iii) otherwise shared a link or the password to your album or User Content. In order for Photobucket.com to permit you to use the Services, you grant to Photobucket.com a perpetual, universal, non-exclusive, royalty-free, transferable, license to use, copy, distribute, modify, print, display and otherwise exploit in any manner any User Content and to enable third parties to use the Services to do the same." I really don't think there can be any doubt that Schmap is commercial! Wcities content usage involves serious expense - they back Yahoo travel, Orbitz etc. - and Schmap make no bones about their commercial orientation on their site, they are a business start-up using a sort of ebook technology to get direct access to your desktop, mobil, PDA etc via their software for advertising purposes. Licensing images is expensive, even with microstock, and their approach is the way things are going: as is evident from responses here and in other blogs, many people are quite happy to let others profit from their images for the perceived kudos of "seeing them in print" as it were. I think Schmap's marketing strategy of "shortlisting" your images - implying that if chosen this is really prestigious for you - is a marketing masterpiece and has worked brilliantly! Currently there are 83 photos tagged with schmap. Currently there are 83 photos tagged with <a href="http://www.flickr.com/photos/tags/schmap/interesting/">schmap</a>. I first considered their conditions as acceptable. OK, they want to make money with my images, and don’t want to pay me, but at least I might get a few more views via their software. You acknowledge and agree that Schmap may update and/or revise the Software and/or the Content at any time that Your computer is linked to the Internet, but is under no obligation to inform You of or furnish to You any such updates and/or revisions. You further acknowledge and agree that Schmap may require You to update certain data pertaining to the Software and/or the Content as a condition to Your continued usage of the Software and/or Content (including without limitation updates and/or revisions required by Schmap’s licensors). This Agreement does not grant You any right, license or interest in or to any support, maintenance, improvements, modifications, enhancements, revisions or updates to the Software or Content. To the extent that Schmap supplies any updates and/or revisions to You, such updates and/or revisions shall be subject to the terms of this Agreement unless Schmap indicates otherwise. Schmap reserves the right to charge fees for any future versions of the Software or Content or any additional modules for the Software or Content. So they could change their software and guides at any time, without even telling me? For example, they could increase the number of ads drastically, or introduce aggressive advertising behaviours (pop-ups…). No way. So I won’t license them my photos. I first considered their conditions as acceptable. OK, they want to make money with my images, and don’t want to pay me, but at least I might get a few more views via their software. But before going to grant them the license, I wanted to check out their software. So I downloaded it, and was going to install it. However, I stopped after reading the following items in their software license agreement: <blockquote> 7. ADVERTISEMENTS AND PROMOTIONS […| The frequency, location, timing and extent of the Promotions shall be subject to change and shall be determined solely by Schmap in its discretion. You agree that Schmap has the right to update and/or revise the Software and/or Content at any time in connection with the Promotions. […] 8. MAINTENANCE AND UPDATES You acknowledge and agree that Schmap may update and/or revise the Software and/or the Content at any time that Your computer is linked to the Internet, but is under no obligation to inform You of or furnish to You any such updates and/or revisions. You further acknowledge and agree that Schmap may require You to update certain data pertaining to the Software and/or the Content as a condition to Your continued usage of the Software and/or Content (including without limitation updates and/or revisions required by Schmap’s licensors). This Agreement does not grant You any right, license or interest in or to any support, maintenance, improvements, modifications, enhancements, revisions or updates to the Software or Content. To the extent that Schmap supplies any updates and/or revisions to You, such updates and/or revisions shall be subject to the terms of this Agreement unless Schmap indicates otherwise. Schmap reserves the right to charge fees for any future versions of the Software or Content or any additional modules for the Software or Content. </blockquote> So they could change their software and guides at any time, without even telling me? For example, they could increase the number of ads drastically, or introduce aggressive advertising behaviours (pop-ups…). No way. So I won’t license them my photos. Alexandra: Many people, myself included, seem to be confused by your selection process. If some flavor of Creative Commons non-commercial photo is short listed and the author is notified but doesn't bother to explicitly withdraw or explicitly permit use then do you assert the right to use the picture? And the same question for CC share-alike? Alexandra: Many people, myself included, seem to be confused by your selection process. If some flavor of Creative Commons non-commercial photo is short listed and the author is notified but doesn't bother to explicitly withdraw or explicitly permit use then do you assert the right to use the picture? And the same question for CC share-alike? In the case of short-listed photos with a Creative Commons non-commercial license, we will only consider these for inclusion in our guides if the photographer explicitly SUBMITS them to our final selection phase. In the case of short-listed photos with a Creative Commons license allowing commercial use, we only notify photographers if these are actually selected for inclusion in our guides. On a related note, we typically keep our selection process live for a week or two after a submission deadline: photographers who made no decision before the deadline, but choose to submit after the deadline, will have their photos considered for future releases of our guides. I’d like to take this opportunity to assure any short-listed photographers reading this post that our editorial process is rigorous, and that only a small percentage of reviewed photographs are actually short-listed. a) For our scheduled first 28 guides, we reviewed a mammoth 448,000 photos (over a four-month period) short-listing only 7,790 of these (1.7%) to continue to our final selection phase. b) A total of 1,949 short-listed photographers had specified a Creative Commons non-commercial license. These are the photographers we’ve contacted to see whether or not they would like to submit or withdraw their photos from our final selection phase. c) Of these 1,949 photographers, 1,534 (78.7%) chose to submit one or more of their short-listed photos; 117 (6.0%) chose to withdraw all their photos from our final selection phase, while 298 (15.3%) made no decision (in which case, as above, their photos would likewise not be considered for guide inclusion). (Schmap Guides will unfortunately not be Mac-compatible until the second half of this year – we’ll post a firm date in our FAQ toward the end of this month). Alexandra Moss:In the case of short-listed photos with a Creative Commons license allowing commercial use, we only notify photographers if these are actually selected for inclusion in our guides. I assume that you don't mean to include CC-by-sa licenses here. These allow commercial use but still would clearly prohibit use in this case. <strong>Alexandra Moss</strong><em>:In the case of short-listed photos with a Creative Commons license allowing commercial use, we only notify photographers if these are actually selected for inclusion in our guides. </em> I assume that you don't mean to include CC-by-sa licenses here. These allow commercial use but still would clearly prohibit use in this case. Right? The Content may include photographs and other data provided by third parties that is licensable to You by way of a Creative Commons license. You can identify photographs that are licensable to You by way of a Creative Commons license (“Creative Commons Photos”) by looking for the “cc” badge found directly below the photograph along with the licensor’s name. You can click on the “cc” badge to access the applicable Creative Commons license. Please note that there are different types of Creative Commons licenses: should you have interest in using any of the Creative Commons Photos for your project, You should carefully review the Creative Commons license terms that apply to such photos. You may also click on the Creative Commons Photo itself to link to a high resolution version of the photograph on the Internet. This Agreement does not limit or restrict Your right to license any Creative Commons Photos. I'm not concerned that Schmap could "prevent share-alike" by which I presume you mean the concern is that Schmap woul prevent others from sharing-alike. I'm concerned that Schmap may use pictures in violation of the terms under which they're licensed. 2)Schmap uses my photos and releases their guides under a CC-by-sa license. As a result, Schmap content would be available for others to use in their own projects for free and without further permission. 3)Schmap requests my explicit permission to use the photo under different terms. 4)Schmap violates the terms of the license. Using a CC-by-sa licensed work without subsequently releasing the new work under CC-by-sa isn't permitted. I'm new to CC but that cleary seems as thought it's how things are supposed to work, no? Incidentally, I got some very useful information from your San Francisco guide. I'm not concerned that Schmap could &quot;prevent share-alike&quot; by which I presume you mean the concern is that Schmap woul prevent others from sharing-alike. I'm concerned that Schmap may use pictures in violation of the terms under which they're licensed. For example, my photos are licensed CC-by-sa. This leaves four possibilities as I see it: 1)Schmap ignores my photos. 2)Schmap uses my photos and releases their guides under a CC-by-sa license. As a result, Schmap content would be available for others to use in their own projects for free and without further permission. 3)Schmap requests my explicit permission to use the photo under different terms. 4)Schmap violates the terms of the license. Using a CC-by-sa licensed work without subsequently releasing the new work under CC-by-sa isn't permitted. I'm new to CC but that cleary seems as thought it's how things are supposed to work, no? Incidentally, I got some very useful information from your San Francisco guide. Do you mean the entire Schmap guide has to be share-alike in order to use a share-alike image? I personally think people get awfully hung up on this stuff. If you don't want them to use your image, just say so and I'm sure they won't. God knows, as a designer, I'd never use a CC-licensed image after seeing all this nightmare hassle they're going through because, frnakly, it sounds like a complete pain in the arse and not worth the time or effort. Cheaper in hassle terms to use microstock in this case. Or All Rights Reserved and ask permission. Do you mean the entire Schmap guide has to be share-alike in order to use a share-alike image? I personally think people get awfully hung up on this stuff. If you don't want them to use your image, just say so and I'm sure they won't. God knows, as a designer, I'd never use a CC-licensed image after seeing all this nightmare hassle they're going through because, frnakly, it sounds like a complete pain in the arse and not worth the time or effort. Cheaper in hassle terms to use microstock in this case. Or All Rights Reserved and ask permission. There's no reason for you to avoid CC licensed materials. Where's the hassle if you abide by the terms? Use CC-by materials with attribution. Use CC-nc materials in non-commericial work. Use CC-sa works and then license your work appropriately. You can do any of this without even asking the author for permission. In my opinion there couldn't possibly be anything more hassle-free. Besides, if you're willing to ask permission for all-rights-reserved materials then it seems like about the same effort to ask a CC-nc author for permission to use the work in a commerical project. It's not really fair to say that CC advocates are hung up on it. I see plenty of people ruining otherwise nice pictures of their lunch or their cat with garish copyright notices. CC advocates on the other hand make a point of sharing their work under far less restrictive terms. I think it's only fair to let them require that these terms be respected. There's no reason for you to avoid CC licensed materials. Where's the hassle if you abide by the terms? Use CC-by materials with attribution. Use CC-nc materials in non-commericial work. Use CC-sa works and then license your work appropriately. You can do any of this without even asking the author for permission. In my opinion there couldn't possibly be anything more hassle-free. Besides, if you're willing to ask permission for all-rights-reserved materials then it seems like about the same effort to ask a CC-nc author for permission to use the work in a commerical project. It's not really fair to say that CC advocates are hung up on it. I see plenty of people ruining otherwise nice pictures of their lunch or their cat with garish copyright notices. CC advocates on the other hand make a point of sharing their work under far less restrictive terms. I think it's only fair to let them require that these terms be respected. "Collective Work" means a work made up of the Work in its entirety in unmodified form, along with other work, assembled into a collective whole. It's not really fair to say that CC advocates are hung up on it. That's not really what I meant. I meant people, in general, are hung up on this stuff. If you want to be a pro, be a pro and sell your stuff, understanding that putting it online for people to download means that they will, and that trying to then contest that is not worth the emotional nightmare. If you want to share, then share and don't get all picayune about exactly how people should credit you, what they are doing with it, how other people can then use those modified versions, ad nauseum.